Every body loves going on holiday to warmer climates to bask in sun with a lovely cocktail, beer or ice-cream. That holiday however can be a war zone for your hair if you don’t prepare well before hand and look after it whilst sunning yourself to that golden tan! We have compiled some of top tips so that you can get your hair into the correct condition and maintain it. The sun, sea and sand maybe relaxing but they create havoc with your hair and split ends travel further, faster. Have the dead ends taken off before you go to seal your hair against damage, making it easier to manage on your jollies! Hair colourants damage the surface of your hair, meaning the last thing your hair needs is a huge boost of sunshine and chemically treated pool water. To limit the damage and give your hair a rest, get your colour done at least 2 weeks before you go. 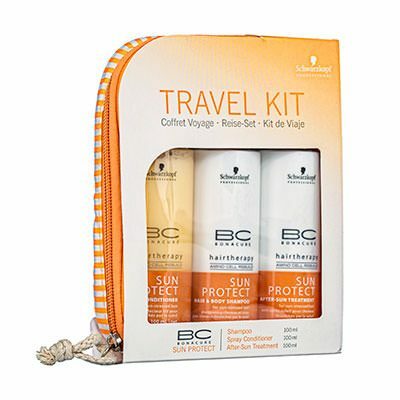 Then use a good, professional series of sun protection hair care products – such as those from Wella or Schwarzkopf. It is well known that if your hair is packed with moisture it will absorb fewer drying and discolouring minerals from the holiday surroundings (that pesky pool water!). Add in a good treatment mask to your hair care regime and reduce the amount of dehydrating heat styling (such as straightening) on the run and while away. We recommend treatment masques from our Bona Cure, Wella SP and/or Redken ranges. Apply it during your salon visit and at home in preparation for that sun-filled getaway. Tie your hair up – The top knot is best for those pool side activities. It looks great (for those holiday snaps and pool selfies), keeps your hair out of the harmful pool water and should it get wet, it stays in shape and doesn’t collapse. To do it – tip your head upside down and spray it with a good hairspray (such as those in the Schwarzkopf Osis range) to help you scoop up all the hair. Put it all into a ‘pineapple’ on top of your head and secure it with a band (don’t pull it too tight – it’ll give you a headache!). Then twist it around until it folds in on itself. Pin in some kirby clips and spray on last time. Don’t rely on cheap hotel products as they are rarely of a decent quality! Always pack a professional quality shampoo and conditioner – preferably one that caters for moisture lock-in or is colour saving/safe. Luckily for you, we stock a wide range of suitable holiday products from Wella SP hydrate and Colour Save to the Kerastase Soleil range – something for every budget and hair type.